Today was the birthday of gillo, lady of letters, the stage, and moulder of young minds. Also? A bit of a doll debaucher as well. *links arms in solidarity* Her beautiful and informative picspam has transported me far away from many a dull work day, and her dry wit is always very much appreciated. 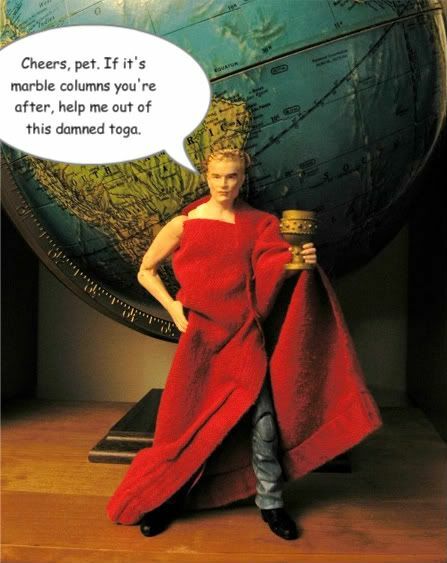 I especially enjoyed reading Gill's accounts of her trip to Rome this fall, so I enlisted doll!Spike's assistance in making a tasteful birthday greeting inspired by her recent travels. *sigh* O, will I never learn? *peeks cautiously through fingers* Would this seem less offensive if I told you that I'm all messed up on cough syrup right now? 'Cause really, I've don't have a problem with blaming the drugs. Or the doll. *points wildly* Yeah! It was all his idea. Get him, ladies! That little naughty doll never loses his focus on what really gets his attention...and the red toga is a great look for him! So true--he's remarkably single-minded in his lechery! Thanks! He's still wearing the toga because I think he looks pretty darned good in it, too. My daughter just caught a glimpse of him and said (between giggles), "Oh, poor Spike. What are you doing to him this time, Mama?" *lol* As if the pity of a child weren't humiliation enough, I also think that one of the cats ate his wreath! He's such a ham - but beautiful with it! Thank you - and Spike - so much! You're very welcome! *lol* I felt that he needed a little extra theatrical flair for your birthday, world-class scenery chewer that he is. Hope you had a lovely day, dear! I might like this even better than the little red apron. Adds a touch of mystery, like. Gives him a classic air of gravitas, which I suspect would lead directly to a gravity surge if he tried to cope with the toga himself. Just what's in that goblet, anyhow? Happy birthday, dear gillo! SPQR! Heeee! Thank you. I've gotten so much mileage out of my red dishtowel in terms of doll props. Well worth the sacrifice. I'm amazed that he seems to maintain some kind of dignity, hauteur even, despite the fact that he's wearing a wife beater and a wreath of trumpet creeper that's held together with a twist tie. *sigh* The people with good bones can get away with murder! Every time I think you've done the absolutely best one possible, you top it!!!! (Oh, and happy birthday to dear dear gillo! I was Alice-obsessed as a child, and your icon is making me giggle. Cute! Good evening to you, sweetie. Hope the weekend has been good to you. I can't think of anything clever to say, so it's good that Spike is clever enough for the both of us right now! He does look mighty fine in a toga! It seems unfair to me that this little doll looks better in an old cut-up dishtowel than I will look in any garment ever in my entire life. The little scamp!